The Ohio River is projected to overflow its banks over the next few days after heavy rains upstream in recent days. 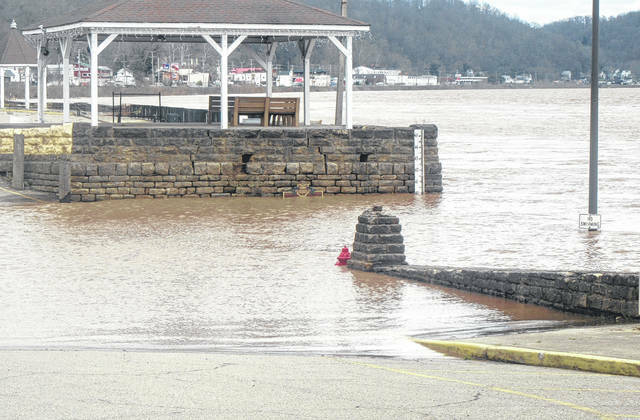 MEIGS COUNTY — Flood waters are once again on the rise in the area after heavy rain on Tuesday. With flash flooding and flooding along the Shade River causing problems in the county on Tuesday and Wednesday, it is the Ohio River which is expected to cause issues later in the week. As of Wednesday afternoon, forecasts for the three river gauges in Meigs County show all three cresting above flood stage on Friday. At Belleville Locks and Dam, the Ohio River was already near the flood stage of 35 feet on Wednesday, measuring 34.54 feet at noon. A crest is currently projected at 39.6 feet on Friday morning. At Racine, a crest of 43.5 feet is projected for Friday at 8 a.m. Flood stage at the Racine Locks and Dam is 41 feet. In Pomeroy, the current projected crest is at 47.1 feet on Friday morning. Flood stage is 46 feet, which puts water on Main Street in the downtown area. For the latest on Ohio River projections visit https://water.weather.gov/. https://www.mydailytribune.com/wp-content/uploads/sites/42/2018/04/web1_4.5-Flood20184416156706.jpgThe Ohio River is projected to overflow its banks over the next few days after heavy rains upstream in recent days.